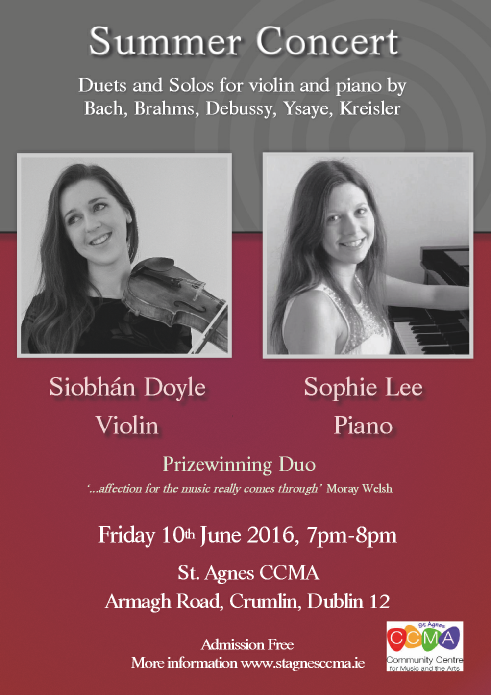 Siobhán Doyle and Sophie Lee have known each other as musical friends from an early age, and are delighted to have this opportunity to play together some of their favourite solo and duet pieces. Together they won the Elsner Memorial prize for Duo/Sonata at this years Feis Ceoil. As individual musicians they are amongst the most talented emerging young artists around. Dublin-born Siobhán Doyle began learning the violin at the age of four with Emma Montenon. After continuing with Maeve Broderick and Gillian Williams, she received a full scholarship to study with Leland Chen at the Royal Northern College of Music where she recently graduated with first class honours and was awarded the Roger Raphael Prize. She has performed concertos with orchestras in Ireland and the UK and received masterclasses from some of the world’s most foremost violinists including Midori, Pavel Vernikov and Graf Mourja. Following a solo performance at the NCH, Siobhán was personally invited to give a concert for President McAleese and distinguished guests at the Áras an Uachtaráin. In 2010, Siobhan was awarded the ‘Alan Gillespie Ulster Bank Award’ for most promising young artist at the Clandeboye Festival and has since been invited back several times, performing chamber music with the International Artists including Andres Diaz, Erica Raum and Michel Lethiec. Siobhán discovered her love of playing with others at an early age in many orchestras and ensembles, most notably from her time spent as leader of the National Youth Orchestra of Ireland from 2009-2011. Chamber music took on a great importance during her time at the RNCM and was cultivated at many international festivals in Ireland, the UK and Sweden. As leader of the Ruzena Quartet, Siobhán had considerable success including a live broadcast on BBC Radio 3 and winning the Nossek Prize and John Barbirolli/Lawrence Turner Memorial Award. Also a member of the Benz String Quartet, further accolades include the Chamber Music Prize and the Hazel de Courcy Lewis Cup at the ESB Feis Ceoil and performances at the West Cork Chamber Music Festival. Currently a member of the European Union Youth Orchestra, Siobhán was chosen to represent the orchestra on a Global Exchange programme to the Sphinx Organisation in Detroit. She has also worked with Manchester Camerata, the RTÉ Concert Orchestra, Sinfonia Cymru, the Ulster Orchestra and Camerata Ireland. Siobhán is kindly supported by the Arts Council and the Music Network Music Capital Scheme, funded by the Department of Arts, Heritage and the Gaeltacht. Sophie began studying the piano under Professor Thérèse Fahy at the age of six in the Royal Irish Academy of Music. She has performed as a soloist from a young age, in such venues as the John Field Room in the NCH and the Freemason’s Hall as part of the Royal Irish Academy of Music's "Chopin 200!" and “Debussy 150!” concert series. Sophie has been a multiple prize-winner at both Feis Ceoil and RIAM PianoFest, and has most recently been awarded first prize in the Senior Pianoforte Solo (2015), the Elsner Memorial Cup (2016) and the Audrey Chisholm Cup (2016). She has had the opportunity to receive masterclasses from acclaimed pianists John O’Conor, Hilary Coates and Philip Martin and has been invited to perform in the Field Room with Siobhán Doyle as part of the "Young Platform Series" in September 2016. Sophie attained her Licentiate Diploma in Piano Teaching at the Royal Irish Academy of Music (LRIAM) in 2015 and currently teaches in Mezzo Music Academy, St. Louis Infant and Primary Schools, as well as privately. She is also an active chamber musician and accompanist, performing regularly at private functions and in the Adelaide and Meath Hospital in conjunction with the National Centre for Arts and Health (NCAH). As a violinist Sophie has played and toured nationally and internationally as part of several orchestras, notably the RIAM Symphony Orchestra, the National Youth Orchestra of Ireland, and Trinity Orchestra, and has performed in RIAM productions of Mozart’s Cosi Fan Tutte (2009) and Handel’s Semele (2012). Sophie graduated from Trinity College Dublin with a B.A. (Mod.) in Music in 2015, achieving First Class Honours. She has been accepted onto the MSc in Performance Science course at the Royal College of Music in London which she will commence in September 2016.